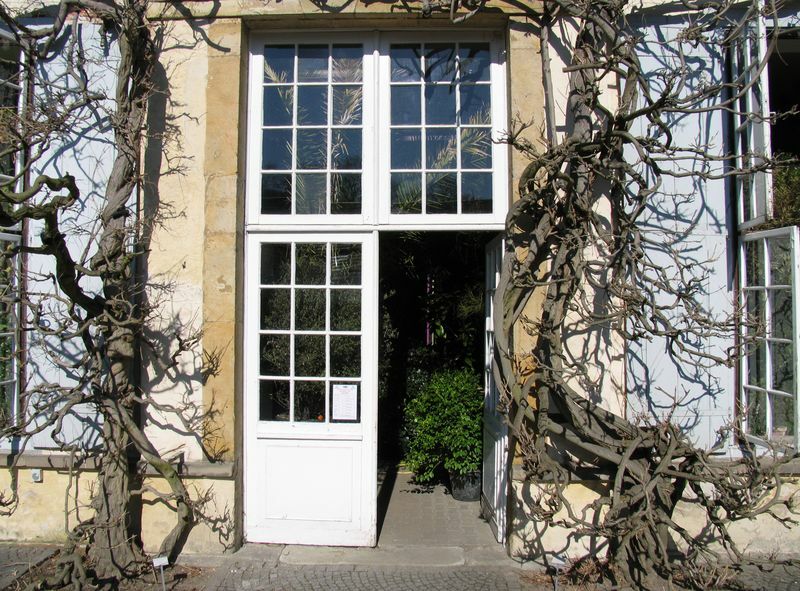 The Botanical Garden in Münster is a scientific institution attached to the Westfälisches Wilhelms-Universität and is mainly used for research and teaching. The garden lies within the palace park and is not only of botanical interest. Its location at the edge of Münster’s bustling old town centre also makes it a popular oasis of tranquillity. The impressive botanical diversity in the various parts of the 4.6 hectare garden ranges from heath and moor landscapes to farm gardens and a collection of Alpine plants. 8,000 different varieties of plant can be admired here. Apart from these outside areas, six of the ten glasshouses are open to the public and are used for exhibiting plants. An orangery was built in place of an early glasshouse in 1840 using material resulting from the demolition of a wall at the palace terrace. Today, it is among the few examples of this type of building in Germany. In 2003, the 200th anniversary of the Botanical Garden’s foundation at Münster palace was marked with numerous events. Built over a period of almost twenty years from 1767-1787, the palace at Münster is the last great Baroque residence to have been constructed in Germany. It was built on the initiative of prince-bishop Maximilian Friedrich von Königsegg-Rothenfels, who commissioned the famous Westphalian Baroque architect Johann Conrad Schlaun with the overall planning and construction of a prince-bishop’s residence. The development of the more than 14-hectare palace garden is closely linked to the history of the residence and its inhabitants. Schlaun’s artistic design featured a geometrical garden modelled on French ideals. However, due to lack of finance, his successor Wilhelm Ferdinand Lipper and the court gardener Franz Conrad Haas were only able to realise part of his plans between 1784 and 1787 so that only the two outer surrounding avenues and the central pool were constructed on the basis of his design. Two longparterres de pelouse stretched from the palace terrace down to this large pool. The terrace was separated from the garden by a wall with a central set of steps. The remaining areas were laid out as a woodedboscage with curved paths. Shortly after the gardens were completed, they were opened to the general public for walks in 1788. An area for refreshments was opened shortly after 1800. Work on the creation of a botanical garden in the area of the Baroque parterre started in 1803 on the initiative of Baron vom Stein. An arboretum was planted to form a landscape on the garden side of the palace. This landscaped part of the grounds gave way to an area with various flowerbeds for systematic collections of plants and special gardens with particular collections. 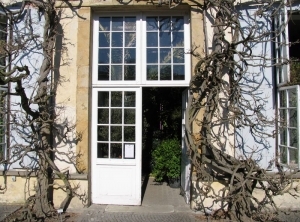 A collection of Alpine plants dating from 1823 is the oldest such garden still in existence today. The pool in the Baroque garden forms a focal point of the area and the first glasshouse was constructed to the north of this. Great care has been taken since the creation of the botanical garden to ensure that there is a free view along the central Baroque axis from the western bastion of the citadel to the garden side of the palace. Instead of the earlier glasshouse, an orangery was built in 1840 using material from the palace terrace wall. Today it is one of the few examples of this kind of building from the classicist period in Germany. Towards the middle of the 19th century, the almost ten-hectare part of the palace garden which did not belong to the botanical garden was converted into a landscape garden following a directive from the Prussian king Friedrich Wilhelm IV. Two prominent 19th-century garden architects were involved in this scheme. Peter Joseph Lenné, the general director of the royal gardens in Prussia, drew up a plan in 1854 for the redesign of the palace garden, which had become neglected over the years. Further planning took place under the direction of Joseph Clemens Weyhe, who, as son and successor of Maximilian Friedrich Weyhe, held the position of royal garden inspector in Düsseldorf . Using Weyhe’s suggestions from 1885, the arboretum of the botanical garden was included in the adjoining areas of the palace garden, the views were enhanced by planting individual shrubs and the network of paths was revised. According to the Prussian king, views out into the countryside were also reinstated. This work was completed in 1860. However, in the following years, care of the garden was kept to a minimum. Instead, the Prussian military forces of the nearby garrison took the liberty of carrying out their annual riding and pioneer exercises here, thereby continuously causing damage to the area. The botanical garden, by contrast, received special care. Apart from the construction of further glasshouses, an island was created in the central lake in 1872. In the 19th century, the botanical garden became affiliated to the medical faculty of the university and was mainly used for instruction on medicinal plants for future doctors. At the same time, the garden fulfilled its educational role for the general public by exhibiting the exotic flora of faraway countries. Like the palace, the gardens suffered extensive damage during the Second World War. When the botanical garden was reconstructed, the area covering 4.6 hectares and the basic concept of the collections was retained. 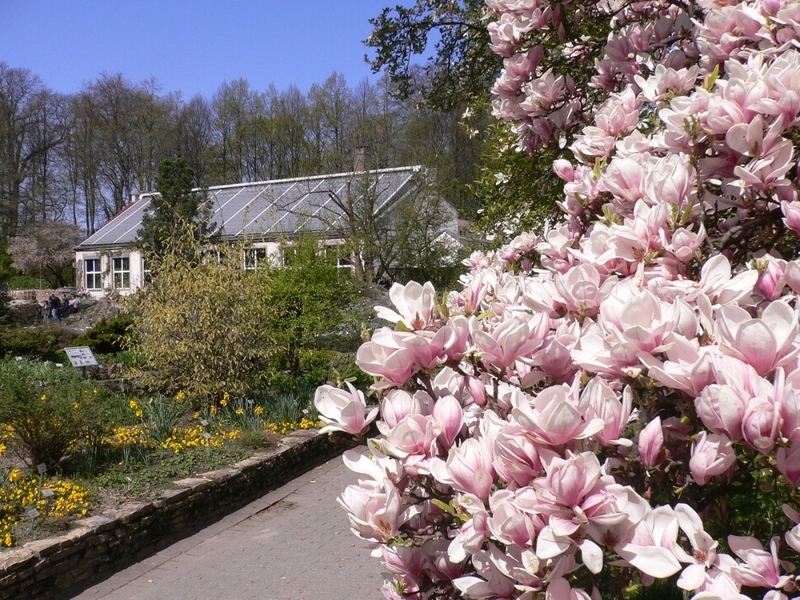 Today, there is much for the visitor to see alongside the systematic collections of plants and the collection gardens – numerous interesting trees and shrubs, conifers, rhododendrons, a farm garden as well as a smell and touch garden by Hugo Kükelhaus. In 2003, the 200th anniversary of the founding of the botanical garden was marked by numerous events. Accessibility The main paths are suitable for people with limited mobility.